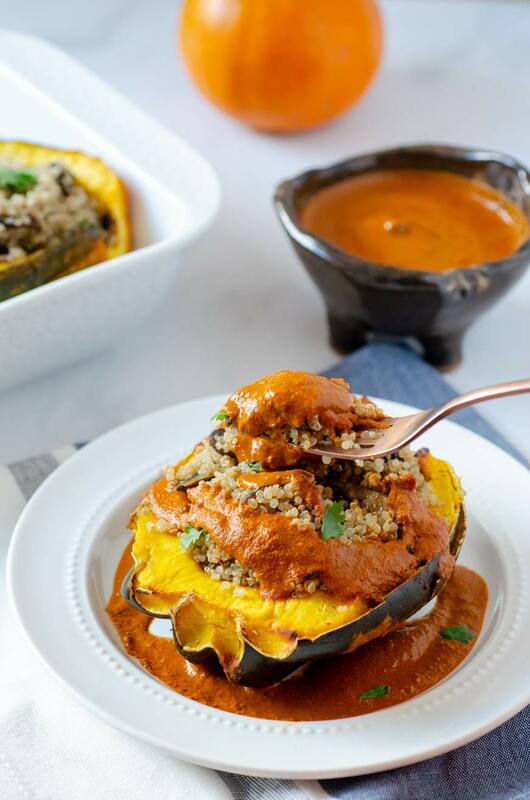 Have you ever had roasted acorn squash?? The roasting brings out the sweetness of the squash and it just begs to be filled with all sorts of veggie goodness. 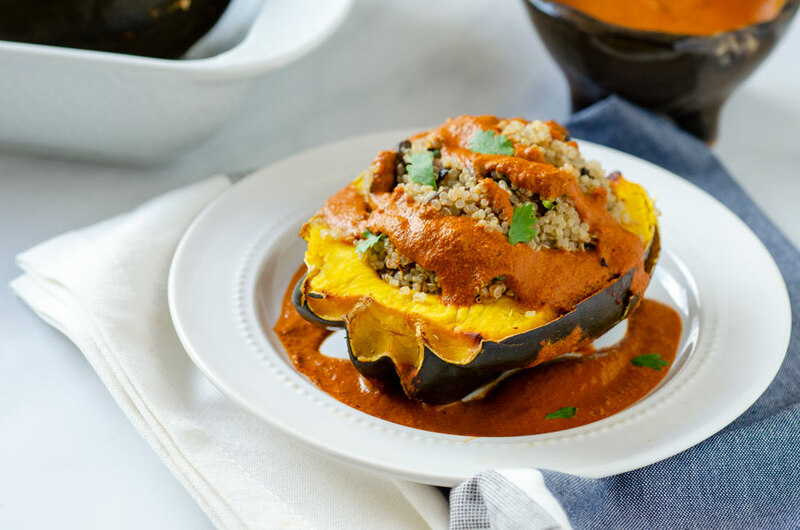 This quinoa stuffed acorn squash is studded with sautéed wild mushrooms and topped with a pipian rojo. , which I highly recommend. 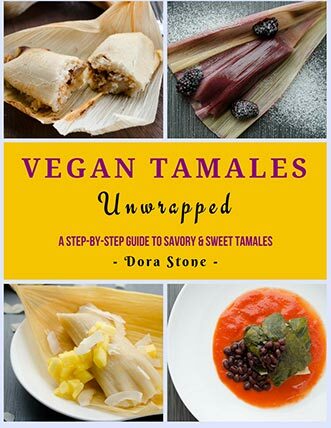 I was supposed to publish this recipe before Thanksgiving since it would make a great vegan Thanksgiving main course, but of course, life got in the way and I couldn’t publish it in time. We hosted Thanksgiving at our house this year, and it was so good to be surrounded by all the craziness and noise that family brings. Our feast was a mix of both vegan and omni dishes. My husband (who is not vegan) was adamant that there needed to be turkey so we compromised and almost all the sides and desserts were vegan.This was my first time trying a vegan celebration roast!! I’m not going to lie, I was a little worried. I ended up buying two, the Gardein Holiday Roast and the Field Roast Hazelnut Cranberry Roast en Croute. 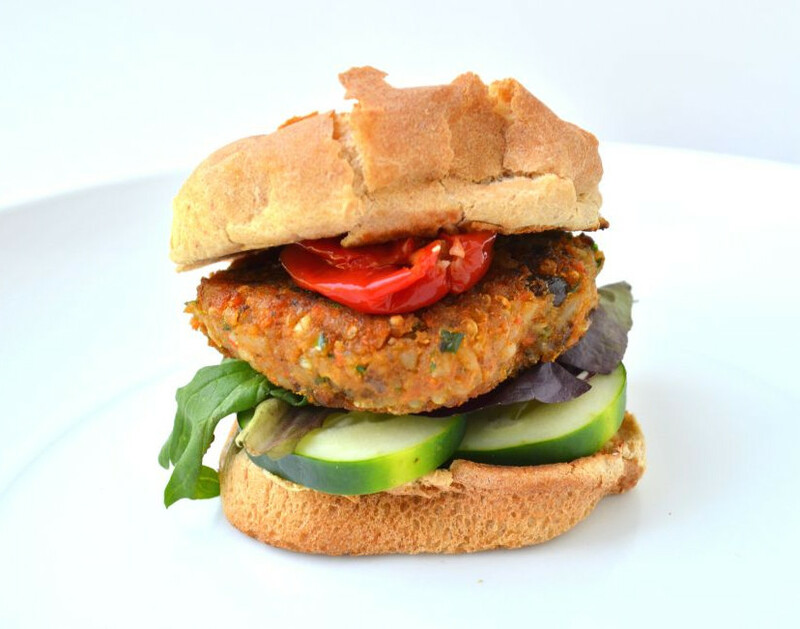 The Gardein Roast is more turkey-like and filled with sort of stuffing. The Field Roast Cranberry Roast is more sausage-like with ginger, cranberries, and apples. The baby and I enjoyed both of them very much. I was very surprised and thrilled when one of my sisters had celebration roast instead of turkey!! After trying both of them, I can’t decide which one I like best, they’re both really good. I do have to say that If you’re more into turkey-like meats then go with the Gardein Roast, if you’re more of a sausage person then go with the Field Roast. How great is it that vegans and vegetarians have so many delicious options available!I’m definitely getting a celebration roast for Christmas. 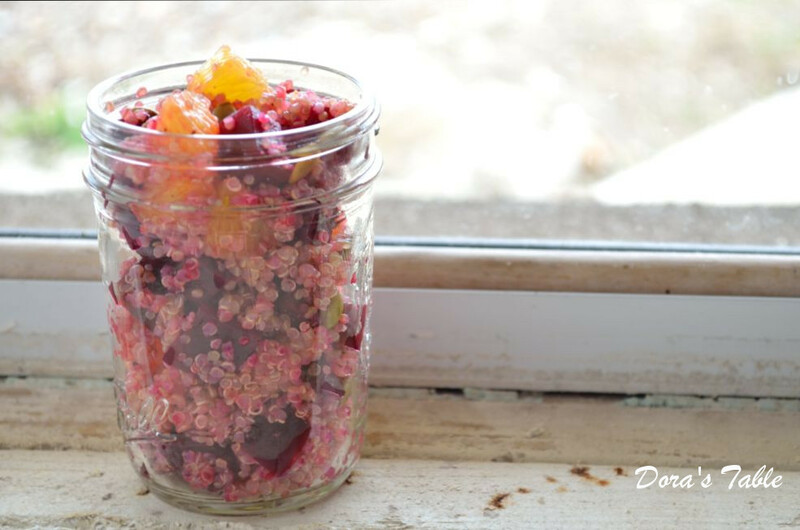 You can make the pipian rojo and the quinoa the day before to make this super fast. 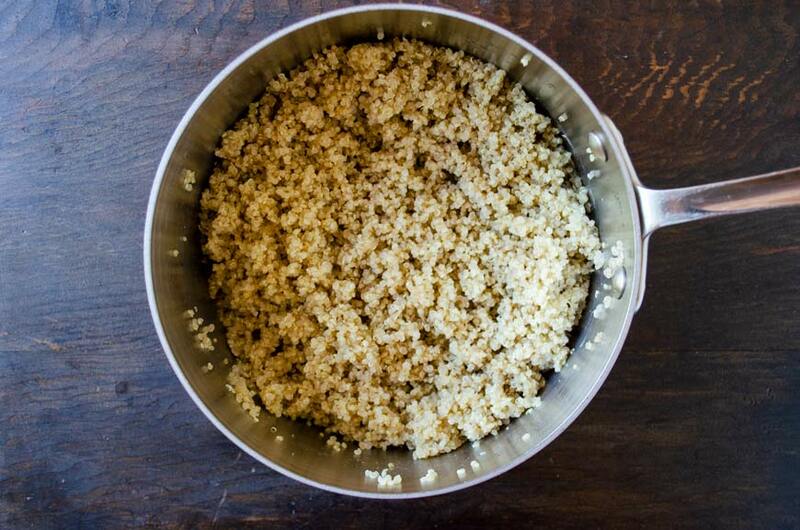 If quinoa is not your favorite you can use rice instead. Kabocha squash would also work really well with this recipe. Wild mushrooms like maitake or oyster would make this dish even better. 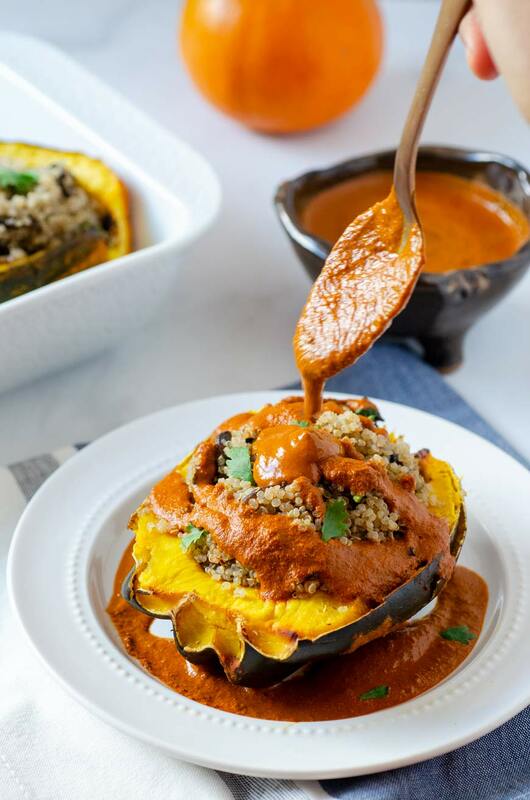 Quinoa stuffed acorn squash with sauteed mushrooms topped with a smoky pipian rojo and cilantro. A great centerpiece for any vegan feast. 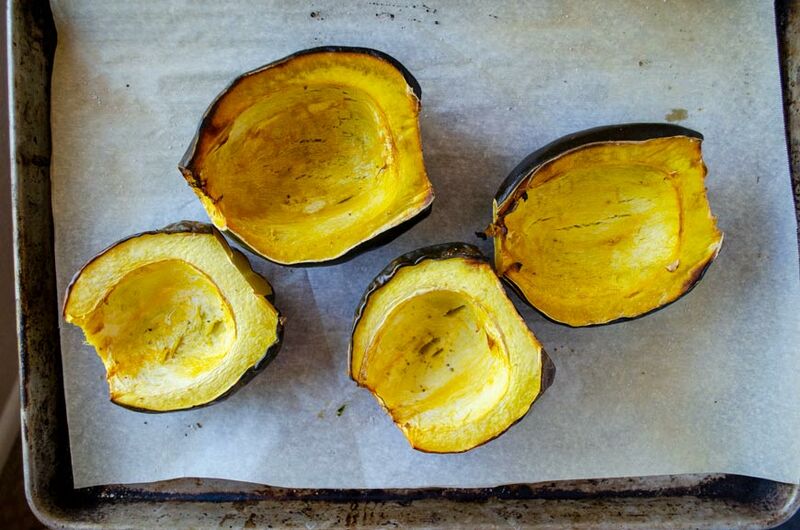 Place the squash, cut side down, on a sheet tray lined with parchment paper. Roast for 30 min. flip the squash over, then continue roasting until tender about 20 more minutes. Remove from oven and set aside. In the meantime, heat a medium pot to medium heat and add quinoa. Pour in vegetable stock and 1 tsp. of salt and stir. 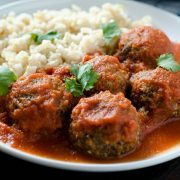 Bring mixture to a very low simmer, cover, and cook for 20 minutes or until the liquid has evaporated and the quinoa is tender. Remove from heat and let sit in the pot for 6 minutes. Fluff with a fork and set aside. Heat a large sauté pan to medium-high heat, add ¼ cup of water (or 1 tbsp. of oil) and cook the mushrooms until golden brown, about 6-7 minutes. If the mushrooms begin to stick, add a little bit of vegetable stock. Lower heat to medium-low, and add shallots, cook for 3-4 minutes or until the shallots are tender. Mix in the greens, and let them cook down, about 1-2 minutes. 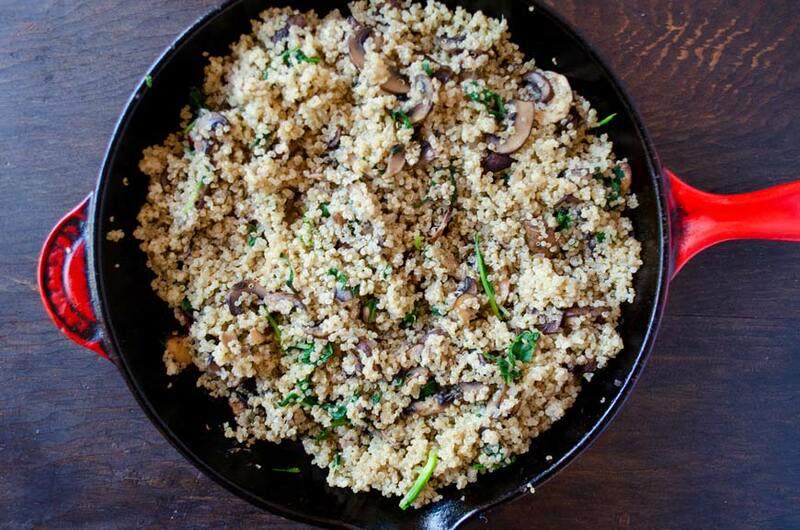 Add the mushroom mixture to the quinoa in the pot, and mix well. Season to taste. 10. Fill your acorn halves with the quinoa mixture and top with the pipian rojo, and chopped cilantro. 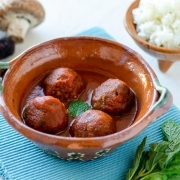 Place plenty of extra pipian rojo on the table, because you will be coming back for more of this delicious sauce! 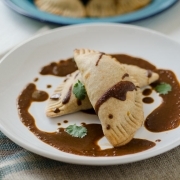 Instead of pipian rojo you could also use mole poblano. 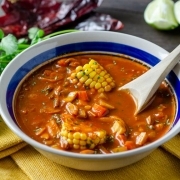 You can make the pipian rojo and the quinoa the day before to make this super-fast. 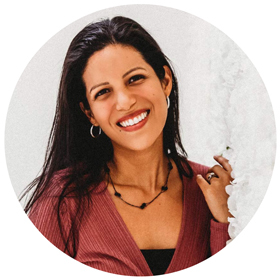 11/29/2018 /0 Comments/by Dora S.